Craving pasta in Alabama? You’re in plenty of company! This fan-favorite dish is one of the most popular in the state, with tons of restaurants dishing out delicious varieties of this classic fare. It’s filling, it comes in endless varieties, and best of all, you’ll savor every bite at these 10 best pasta places in Alabama. Country cooking and Italian cuisine come together in one beautiful blend. Having served the area for over 11 years and counting, you can expect hearty portions and some of the most authentic flavors of Italy. They even serve beer and wine to complement your true Italian experience. Pizza and Pasta go together like peanut butter and jelly—you just can't have one without the other. All of their pasta dishes are made fresh and baked to perfection, and pair perfectly with their signature Pizza dishes. Portions are plentiful, so make sure you come hungry. They're oven-baked pasta dishes truly make life worth living. 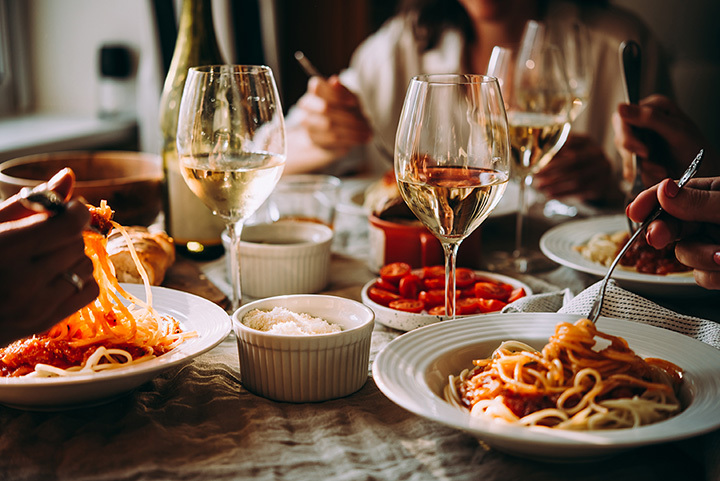 Classics like spaghetti and fettuccine are found alongside elevated fare like steak tetrazzini and baked shrimp alfredo to ensure you get whatever you're craving. All their pasta dishes are served with breadsticks, making every bite even better than before. This Italian menu will leave your appetite wanting for nothing. Take your pick of delightful favorites like lasagna, manicotti, spaghetti, or the fan-favorite blackened chicken pasta. For an even harder your meal, you can add meatballs or sausage for a slight upcharge. The most refined Italian dining experience in Birmingham, this lineup of pasta favorites is not to be missed. Upscale fare like braised pork ragu, penne vodka, and linguini with clams create the perfect blend of rich flavor and artisan-style recipes. With ingredients like pancetta, mushrooms, spinach, and a variety of specialty cheeses, you can rest assured that every pasta dish here taste good and is good for you. Generous portions of classic and meatless pasta dishes ensure something for every palate. They make it easy to get the pasta meal you're craving by letting you choose your preference of sauces, meats, or other add-ons for an experience that's uniquely you. It's the ideal place for vegetarians and meat lovers alike. You'd have to go all the way to Italy to find Italian fare that even comes close to this place! They're all about options here, especially when it comes to choosing a meal that matches your appetite. Light sauces, hearty meat dishes, and everything in between are sure to make your eyes bigger than your stomach. Folks love coming here to get their money’s worth! Huge portions can easily stretch one meal into two, giving you all-around value in your order. They’re also one of the only places around that offer both gluten-free and veggie pasta variations! This Greek grill is dishing out some of the best pasta meals you’ll ever taste. They’ve got just about every noodle style you can think of, including cannelloni, spaghetti, manicotti, ziti, angel hair, and fettucine, all served with a variety of fresh meats, veggies, and sauces of your choosing. The hard part will be choosing just one! They brag about having the best pizza in town, but don’t think they’re skimping on the pasta dishes! Their small selection of pastas pack big flavor, including lasagna, spaghetti, and a veggie lasagna that’s out of this world. If you’re looking for a new twist on classic spaghetti, try their Seuie Seuie, which includes an EVOO sauce, tomatoes, garlic and basil for a lighter, yet flavorful alternative.